The Automower 535 AWD is specifically designed for commercial use. With no emissions and low energy consumption it’s the perfect machine for sustainability. Equipped with commercial interface for simplified and robust interaction. With remote mower management and surveillance through Husqvarna Fleet Services. The Automower range is designed to run without the need of an operator. The inbuilt GPS system creates a map of your garden, boundaries and guide wires registering where it has already mowed and optimising lawn coverage. It can cover up to 3500m2 of lawn, working in complex areas, tough terrain and slopes up to 70%. The automower has automatic charging and it will return to its station automatically. This machine can cover large areas of grass, 3500 m2 with a cutting width of 20 cm and height 30-70 mm makes this the perfect mower to consistently maintain areas of large green space in the private and public sector. Therefore freeing up employees time to work on more important tasks. The grass is cut with three fine razor sharp blades to cut every blade of grass leaving your garden in the perfect condition to continue to grow healthy and strong. The three free hanging blades are mounted on a disc and are easily replaced. With each automower comes 9 extra blade pieces. It is weatherproof and will cut your grass in all working conditions (except snow) you can customise this in the automowers settings. 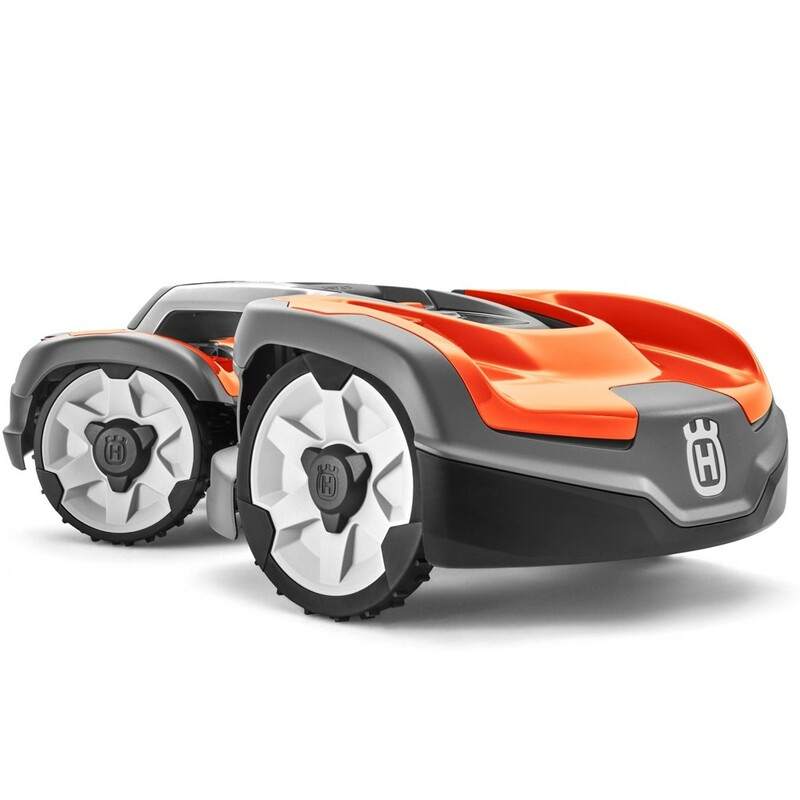 When you order a robotic mower you get access to the Husqvarna Fleet Services app. With the Automower app (which you can download for free on your smartphone) you can remotely control your mower. You will have full control of your mower from anywhere in the world. Perfect if you’re on holiday and want to change the settings if the weather changes back home. Fleet Services – we include a 10 yer data plan for 3G/2G. Thanks to the in-built GPS you always know the exact location and status of every robotic mower. Notifications if anything should happen you will receive a notification on your phone. You will also need an installation kit. This will provide your mower with everything it needs to map out your designated cutting area.